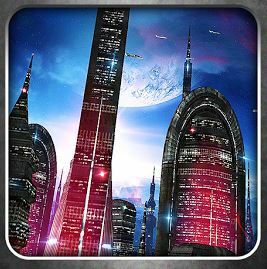 Space Colony is a live wallpaper app that lets you discover what a space colony might be somewhere in the galaxy. You can choose one of five different places and see how the city looks from that point of view. The space colony is surrounded by a toxic aura that you can set in different types of color and power. You can also change the illumination of the buildings and set different camera paths. The space colony looks really beautiful, it makes you wish you were there somewhere. This app requires Android 2.1 and above for it to work and you can buy it on Google Play Store and set it up in no time.